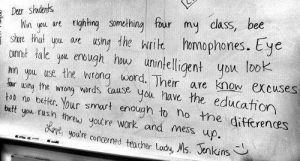 Don’t you (ewe) love how Ms. Jenkins, the teacher who wrote the above note, thinks? It’s the same way (weigh) I (eye) try to (too, two) help my readers remember the perils of following spellcheck too closely; it only does one (won) thing well: it checks spelling. Writers have to be (bee) aware of whether (weather) the words they’ve written are the right (write / rite) ones or not (knot / naught). So here (hear) for (fore / four) your (yore / you’re) learning pleasure are a few more (moore) homophones to learn about and remember. Lazar (n.): A sufferer of an infectious disease, especially leprosy. Were any of these new to you? I hadn’t known about lazar or ley, and I didn’t realize laser was an acronym.